I have had pretty paper for a long time and have just wanted to use it, not sure why we hang on to the really pretty papers. I was inspired to make a couple of cards with it and I am happy that I did. I used an easy to use sketch, I popped up the decorative top panel. I stamped the sentiment added layers of decorative paper then popped up the sentiment as well. I finished with gems. Supplies: White cardstock, Designer Paper - SEI, Technique Tuesday - Inspired Dragon Fly, gems. 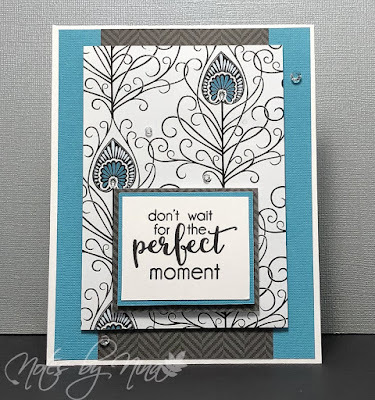 Ha ha, I like the sentiment on the card....don't wait for the perfect moment to use your nice paper!